Subtivals, ready for Cinelatino ! The film festival CineLatino in Toulouse opens its doors today ! And I've just delivered the source package of version Subtivals 1.5.0 to the building robots of Launchpad ! During the festival, Subtivals will not simply be used for captioning, it will be the key tool for the projection of two movies specifically, for which some very rich deaf-specific subtitles have been prepared ! As the same time, we are receiving very positive feedback from users in Turkey, Poland, Greece... thank you all ! In addition to the Windows demo version, mallox packaged a Mac OS X automatic installer. 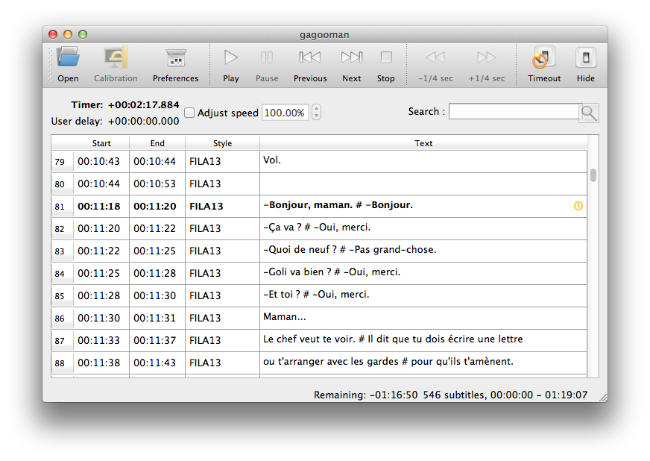 We mainly reworked the subtitle positioning system, in order to support linespacing control, absolute and relative positions, using PlayResX and PlayResY.